WELCOME TO WD PREFAB LTD.
WD Prefab Ltd. is a manufacturer of stainless steel furniture and equipment used for food preparation mostly in kitchens, hotels, bars, restaurants, canteens, pubs, schools' canteens, professional buildings and hospitals. Mostly we specialize in manufacturing of tailor made equipment. We provide services both for big and small gastronomy business. 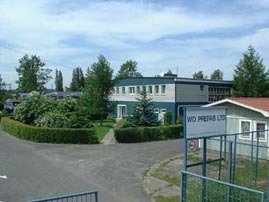 Company was founded in 1994 by JL Prefab International and Wexiodisk AB in order to supply the east market with high tech equipment manufactured in plant located in Pruszcz Gdanski just 10km outside Gdansk (Danzig) in northen Poland. The location is close to the harbour of Gdansk, the harbour of Gdynia, "A1" highway and the airport for best logistics. Workers of WD Prefab Ltd. are high qualified, with 5 to 25 years of experience in work with stainless steel. Beside standard stainless steel furniture we produce: ventilation hoods with Anti-fire Systems: ANSUL 102 and Automatic Self-wash Systems, heating equipment, cooling and freezing equipment, salad workbenches, dishwashing equipment and popcorn towers. We also equip gastro-caravans (with project of the most economical use of the caravan's interior) . We can provide our services to our customers all over the world. Experience of many years' standing on the market let us to work out many technologies and standards, which meet an expectation of each Customer. Contact us today to discuss your unique opportunities. General Manager of WD Prefab Ltd.